This week’s winner is @MeeshCatherine for her picture of the Boulevard Pool at Cosmopolitan. This is my favorite pool in Vegas. I love that the pool is on the strip, the multiple levels, the environment, the recreational games and on and on. I don’t feel like I’m missing anything at the Boulevard Pool. I can relax and yet be right there for the Vegas action. It’s also great for people watching on the strip. I wish Planet Hollywood would renovate their pool in the same fashion. 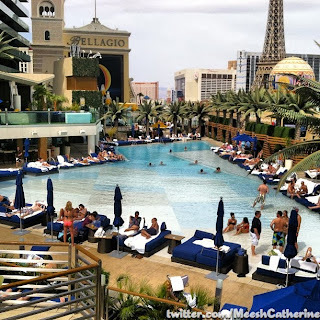 Even if you are not much of pool person, you should really check this out if you’re ever staying at Cosmopolitan. "Download MP3" link is missing!!! What am I gonna do with my Sunday afternoon now?